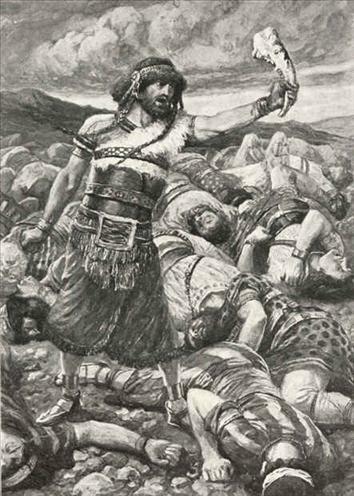 Old Testament - Today we begin reading four chapters about Samson, the last of the judges. You'll notice that the author of Judges often compares the story of Samson's birth and life with the story of Israel. Samson was a Nazirite, which meant he could drink no alcohol, could not cut his hair, and could have no contact with the dead. I found it interesting that Samson's mother was commanded by the angel in Judges 13 today to not drink any alcohol during her pregnancy. Obviously this is important for health reasons, but also it seems it is important because Samson was a Nazirite - whose life began in his mother's womb. More info on Nazirite's is at this link. Judges chapter 13 verses 19 & 20 are awesome to consider - "Then Manoah took a young goat and a grain offering and offered it on a rock as a sacrifice to the LORD. And as Manoah and his wife watched, the LORD did an amazing thing. 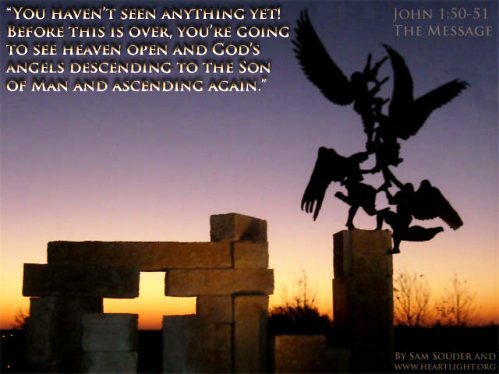 As the flames from the altar shot up toward the sky, the angel of the LORD ascended in the fire. When Manoah and his wife saw this, they fell with their faces to the ground." 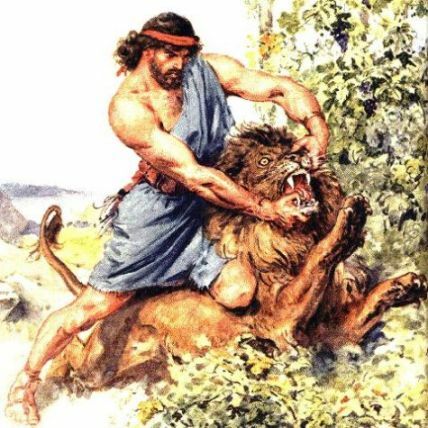 Interesting story today about Samson & the lion! Pretty gross that he ate the honey made in the lion's carcass on the way to his wedding! :) You'll note in our readings of Samson that he is drawn to Philistine women, which was against God's law and the Philistine's were Israel's enemies then. Hence, his parents did not approve of the marriage early in chapter 14. Okay - back to the lion, and verses 5 & 6 - "As Samson and his parents were going down to Timnah, a young lion attacked Samson near the vineyards of Timnah. At that moment the Spirit of the LORD powerfully took control of him, and he ripped the lion's jaws apart with his bare hands. He did it as easily as if it were a young goat. But he didn't tell his father or mother about it." New Testament - I absolutely love John chapter 1 verse 29 - "The next day John saw Jesus coming toward him and said, "Look! There is the Lamb of God who takes away the sin of the world!" 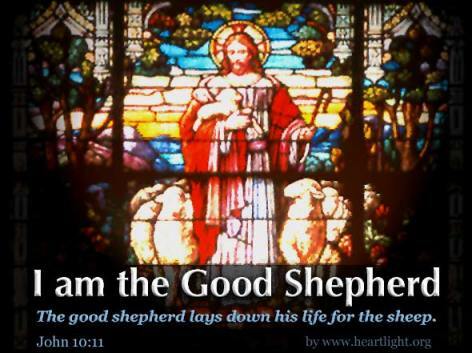 Do you believe Jesus is the Lamb of God who takes away the sin of the world? Verses 45 & 46 I find so truthful, along with Nathanael's reply being amusing - but mostly Nathanael's reply demonstrates how very humble of a background Jesus came from - "Philip went off to look for Nathanael and told him, "We have found the very person Moses and the prophets wrote about! His name is Jesus, the son of Joseph from Nazareth." "Nazareth!" exclaimed Nathanael. "Can anything good come from there?" Are we ever like Nathanael - having preconceived notions about places or things or maybe even Jesus? Can we leave our preconceived notions about things behind us and move forward in the spirit of truth, particularly when it comes to Jesus and who He is? 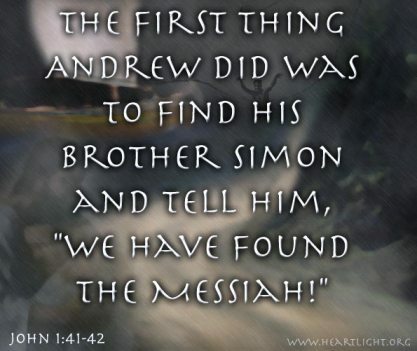 Bible.org's commentary on John chapter 1 titled "The Witness of John" is at this link and commentary titled "The First Disciples" is at this link. Psalms - Psalm 102 is a great reminder to us on the importance to pray. To bring our troubles to the Lord. Psalm 102 can also definitely be a comfort for us during a time of sorrow. I love the reminder about God in verse 27 (which Hebrews also reminded us of today in the verses above...) - "But you are always the same; your years never end." God does not change. He is perfectly consistent. We are oftentimes inconsistent. But, our inconsistencies do not change God's consistency. 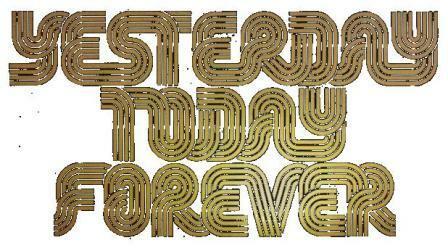 He is always the same - yesterday, today, tomorrow and forever. God is the one sure thing in life that you can count on - forever. YouTube: Psalm 102:27 in today's readings reminded me of the Hillsong song "God of Ages:"
Do you know our God of Ages? Click here to meet Him! Prayer Point: Pray that Jesus has taken away your sins through your faith in his life, death on the cross for your sins, and his resurrection. Pray that you have repented from your sins and have left them at the Cross. Comments from You & Questions of the Day: Based on this Proverb reflection today, how about you? Are you cautious and do you avoid danger? (maybe too cautious sometimes?) Or, do you plunge ahead with great confidence? With too much confidence? Is this foolish? Also, what verses or insights stand out to you in today's readings? Please post up by clicking on the "Comments" link below! The implication here is that conception begins in the mind of God and not at the moment of conception. That is way DEEP! In also reading about Samson, I wonder if his family rehearsed within his hearing the calling upon his life? Did they tell him of the circumstances of his birth; and if they did, did he think they were just some crazy nuts who gave birth to him in their old age? The fact that he killed the lion, ate the honey out of the carcass of a lion, and didn’t tell them may mean that had warned him, told him about the laws governing his life. I’m wondering if Samson was a little arrogant and impressed with his own “press” because of his strength. Did he not understand that who he was and what he was able to do came from God? Did he think he was “all that?” When he turned in to see the state of the lion, while going to his wedding, was it to see his handiwork. Knowing that human nature and our tendencies to “dance” at the goal line when we make a big score is not a new phenomena, leads me to think Samson was not very humble, like Moses. Which begs the question, Am I like Samson?